The fallout from a patent dispute between Kodak and web photo site Shutterfly could embroil many online image sites, says patent experts. 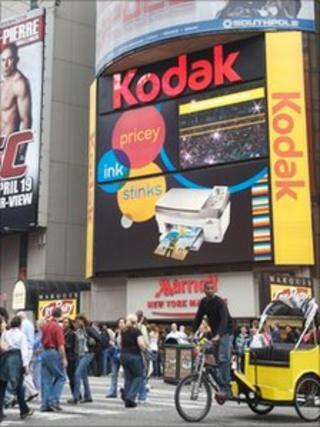 Kodak claimed it owns patents regarding the display of online images that is being infringed by Shutterfly. The photo-sharing site disputes these claims and has launched a counter suit. But the landmark case could have ramifications for other popular online photo sites such as Yahoo's Flickr and Google's Picasa. The past two years have seen a number of cases launched that claim online photo sites have breached patents. But this is the first time such a large, established technology company has sought to assert its rights over online images, said Deborah Bould, a specialist in intellectual property at law firm Pinsent Masons. Kodak's decision to start legal proceedings against Shutterfly will have put scores of web-based photo companies such as Flickr and Google, on high alert, she told BBC News. "The patents Kodak holds are incredibly broad, effectively covering images that are stored centrally and can be ordered online," she said. That's likely to mean Kodak will go after other online image sites it believes also infringe its patents, she added. Kodak said it has over 400 similar patents. "We are committed to protecting these assets from unauthorised use," it said in a statement. Given the expense of patent cases, many smaller firms may choose to licence Kodak's technology rather than fight claims, said Theo Savvides, head of intellectual property at Osborne Clarke. But firms such as Google and Yahoo "have deep pockets" that would allow them to challenge Kodak's claims, he added. Such challenges would likely focus on the validity of Kodak's patents, said Ms Bould. The case may hinge on Kodak's ability to show that when it filed the patents they covered technology that was genuinely innovative, she added. Kodak has been hit hard by the shift towards digital photography, but has recently shown a greater willingness to assert its rights for technology it believes impinge on its patents. Earlier this year Kodak said it would sue Apple and BlackBerry maker, Research in Motion, over technology used in their handsets.